OPAC system is provided in the OPAC area, each reading room and loan stack room, to achieve the bibliographic retrieval, loan, renewal, reservation of library collections and reader's information management services. At the same time, the NLC website provides "Wenjin Search". After logging in the system, readers can search information resources from various carriers. The NLC has established a reader reference system based on readers' needs. The General Information Desk provides general information inquiry, answering user inquiries and helping users access the collections; each service point provides reference services for its collections; Social Sciences Reference Room and Science &Technology Reference Room provide professional reference services, which meet the users' professional information needs through SDI consultative tracking, sci-tech novelty search, documents citation verification service, fact checking service, literature review writing and so on. Enterprise Information Services Center provides in-depth processing information services, such as press clippings, alerts, market data, industrial information and research reports, etc., and deploys information customization services; Legislative Reference Service Department provides information support and guarantee for legislation and decision-making of central government institutions, and deploys various services, including the service for "The National People's Congress & The Chinese People's Political Consultative Conference", information express, lectures for executive leaders, reference services for legislation of the National People's Congress, etc. Meanwhile, the virtual reference desk was launched to provide real-time network reference services, primarily providing information services for remote readers. There are 27 reading rooms in the Library, providing open-stack and closed-stack reading services for library collections, such as the Chinese & foreign languages books, periodicals and newspapers, rare books and special collections, featured special collections, microforms and digital resources. Among those reading rooms, there are 17 open-stack reading rooms. The readers can enter all reading rooms by holding his/her reader's card, and can enter the open-stack reading rooms by his/her second generation ID card (Readers aged from 13 to 16 must carry their own Reader Cards). The Chinese Books Loan Room provides loan service of about 500,000 Chinese books (some attached with disks) in the previous 3 years (including current year); the Lending Desk for Foreign Books in Stacks provides loan service of foreign books published in the previous 20 years collected in the stacks; the Information Commons provides portable mobile electronic readers (or the readers bring their own mobile electronic readers) to download and read the E-books from the E-books recourses platform; the online readers can also borrow Apabi E-Books from NLC's website. Document Delivery Service Center provides document searching, document delivery, literature translation and other document supply services for readers. Individual users can make retrieval requests from the Center via various communication manners, so that users may obtain information unavailable at their local libraries or institutions. The Document Delivery Service Center provides interlibrary loans and international interlibrary loan services. The NLC has built the interlibrary loan relationship with more than 500 libraries from 67 countries. The center provides document supply services for libraries or institutions with an NLC interlibrary loan relationship, which can make retrieval requests from the Center via various communication approaches or NLC interlibrary loans & document delivery system. To present National Digital Library of China construction achievements, and make users experience digital library, understand, utilize and share the resources and services of National Digital Library of China through exhibition of the National Digital Library of China construction achievements, interactive experience area of digital library, resources presentation and introduction area, future imagination area and other various multi-media display projects in flexible, interesting and interactive manners. The NLC provides both self-assisted photocopy services and staff-assisted photocopy services at reading rooms and public service areas. The modern and professional photocopy equipments are used to provide various services, including document photocopy, scanning, printing, microfilm restoring, photography, binding, disc burning, etc. The NLC has held lectures since 1953, inviting famous speakers, such as Guo Moruo, Lao She, Ba jin, Ding Ling and so on, to make lectures. The lectures services have already become the important window of social education and knowledge dissemination. A series of lectures in various forms with rich contents have been held over the years, including "Wenjin Lecture", "NLC Forum of World Library Directors", "Chinese Classics & Culture", "Wenjin Reading Solon", etc., which build an exchange bridge for experts and the public. The NLC held a Book Fair in 1929, which opens the prelude to various cultural exhibitions. The exhibitions have become the important window to collections introduction and social education. In recent years, a large amount of famous cultural exhibitions have been held with the support of national finance, which obtain favorable social and economic benefits. The NLC training has always been committing to the mission to serve the society. Over the years, focusing on the demands of library community and various circles of society, the NLC has cooperated with renowned academic and cultural institutions for holding various trainings, including reader training, library business training, education with record of formal schooling, and continuing education, which cultivate a lot of talents for the society. The NLC provides self-registration services. Readers aged 16 and above can process reader's card in the self registration and recharging machine by his/her second-generation ID card, and then increase loan function, modify password, etc. by reader's card or second-generation ID card. The NLC provides self-recharging services. Readers aged 16 and above can process reader's card in the self registration and recharging machine by his/her second-generation ID card, and then do self-recharging by reader's card or second-generation ID card. To offer convenience to our readers, the NLC introduces RFID self circulation system, which doesn't only realize automatic and intelligent collections finding, stack checking and shelving, but also achieves readers' self-lending and returning of books. 24-hour Book-return Machine is located at south side of east entrance, NLC South Area, where readers can enjoy 24-hour book return services. The NLC provides self-photocopy services to satisfy readers' self-photocopy services. The self-photocopy system may use 2 kinds of cards, i.e. NLC Reader's Card and second-generation ID card. By relying on NLC's existing network environment and one-card payment system, the self-photocopy system administers user's account, authorizing and charging by NLC reader's card, so as to precisely supervise users, uses and costs. Holders of reader's card can photocopy documents in the Self-photocopy Service Point of the Library, and costs will be deducted from his/her account automatically. "NLC Mobile Digital Library" provides various services, such as WAP website, short/multimedia messages, mobile applications, portable handheld reading via cell phone, tablet personal computer, Electronic Reader, etc. Readers can access to library resources and services at anytime in anywhere. The NLC mobile portal website integrates the NLC system and resources into one information management platform, through which users can quickly enjoy the NLC services and access to related resources via various terminals, such as cell phone, tablet personal computer, etc. Mobile portal can fulfill the functions of book renewal, returning, reservation, reservation arrival notice, user registration, and so on, and services closely related to readers through user management system. "Service Online" provides online reading, online lectures and online exhibitions. The NLC provides short/multimedia messages subscription services about loan and reading for mobile users of China Mobile, China Unicom and China Telecom through a special number of 106988106988. The messages cover book returning, renewal, reservation arrival notice, Reader's Card loss report, opinions and suggestions, and so on. The NLC also delivers related information for readers regularly who open subscription services. The NLC provides a series of applications for Apple system and Android system, including applications for services, i.e. National Digital Library of China, and applications for resources, such as New Year Drawings, Wenjin Classic Reading, Four Condemnation Novels, and so on. Up to present, users from 43 countries have visited the NLC applications. The mobile digital library reader is a kind of reader which is customized by the NLC. It is loaded with lots of electronic high-quality books, pictures, periodicals, as well as audios of the NLC lectures, making readers enjoy the pleasure of reading. Digital library mobile reading platform is another mobile service of National Digital Library of China for authenticated readers of public libraries in nationwide. The platform collects about 70,000 high quality E-books, 1,000 titles of E-periodicals, 30,000 pictures, 1,000 videos, short films, and excellent featured resources from local libraries. For public libraries which have been connected with Unified User Management System, users can access to the resources of main station of reading platform, and featured resources of other public libraries by their own Reader's Card (Identification Card) and password free of charge. For branch stations which have not been connected with Unified User Management System, users can browse high quality E-resources by real-name registration in the reading platform or reader portal of National Digital Library of China, and then logging on the platform or portal. The NLC has established ten Gigabit fiber network, with more than 6,000 nodes connecting all subsystems in the Library, which connects with China Unicom and China Telecom with hundreds of megabytes of Internet outbound bandwidth. The NLC network connects China Education and Research Network, China Science and Technology Network, External Network, Party School of the Central Committee of C.P.C. Library, the Central Institute of Socialism, China RFTcom, Gehua Cable Network, China Disabled Persons' Federation, and Legal Affairs Office of the State Council with leased lines. At the same, the NLC network takes part in CNGI, with 1000 trillion IPv6 connection. With the high-performance and multilink network, the NLC provides various resources and advanced services for the Party, government and army, the educational and research institutions, and the public. Wireless local area network is available in NLC South Area, NLC North Area, and Ancient Books Library, by which readers can get rid of the shackles of cable and geographical location, and access to NLC network resources in anywhere of the reading area. The service enables users to seek the exact target book precisely by virtually presenting users a vivid, three-dimensional navigation map. Concrete measures are as follows: after getting the target book in OPAC, click the book and go to the details, and then click "all single items" to trace the "location" hyperlink, then the intelligent navigation map will be available. 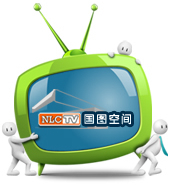 NLC's digital television service is launched by the NLC in cooperation with Beijing Gehua CATV network Co. Ltd., which delivers the resources and services, suitable for issuing through digital television, to 3 million digital TV households in Beijing though the cable television network. The NLC will provide services in terms of "NLC Lectures", "NLC Exhibitions", "Reading though TV", and "NLC Treasures". The content selection is public-oriented, and more personalized services are also available through an interactive portal. Touch-screen experience system of digital resources is launched for better presenting the NLC resources and services, which is a new human interface device. Readers can browse the digital resources in touch-screen experience system by using fingers to touch the graphics, text, or buttons on the LCD screen, without the help of keyboard and mouse. The convenient, quick, and humanized design of the system is welcomed by readers. Based on the abundant collections and various services of the NLC, the system provides presentation of abundant resources. Up to present, the touch-screen experience system of digital resources has covered the following contents, including library collections, E-newspapers and E-periodicals, lectures online, exhibitions online, services introduction, Wenjin Book Award, Chinese Government Public Information Online, etc. According to the characteristics of children, the touch-screen experience system in NLC's Children's Library presents comics, children periodicals, E-books, children games, children's original works, and so on, which enrich children's reading life. Virtual Reality services include virtual navigation and the virtual reading terminals. Environmental simulation of the building's physical architectures and reading rooms distribution of NLC North Area can be achieved by computer systems. Users can virtually "visit" the architecture and layout by downloading the programs. Meanwhile, specialized equipments are also set in specific areas, providing browsing and experiencing of e-books. Users can virtually turn on pages through non-touch interactions. The CDLIV website, co-developed by the NLC, Information Centre of China Disabled Persons' Federation and China Braille Publishing House, fills the vacancy of digital library for visual impairment in China. The CDLVI helps people with visual impairment enjoy the considerate services of a national level library without going out, and enjoy the convenience of information society. in a sense, CDLVI opens a gate for people with visual impairment for knowledge acquisitions. National Digital Library of China Project is an important culture facilities construction project during the tenth five-year plan period. Adhering to the principle of "serving while constructing", National Digital Library of China (NDLC) increases the titles and amount of digital resources continuously, enlarges service scope, and develops online services. As of the end of 2009, the capacity of digital resources has had exceeded 327.8TB, and the capacity of self-constructed digital resources has amounted to 239.1TB. One-stop service of digital resources is provided through NDLC portal. Up to present, 720,000 E-books have been issued in Internet, and more than 1 million E-books have been issued in the Library Intranet. At the same, the digital resources have been delivered to the local libraries nationwide through the platforms of NDLC and National Cultural Information Resources Sharing, providing services for the public.